Jay Anthony Prague, Trivedi Global Inc. 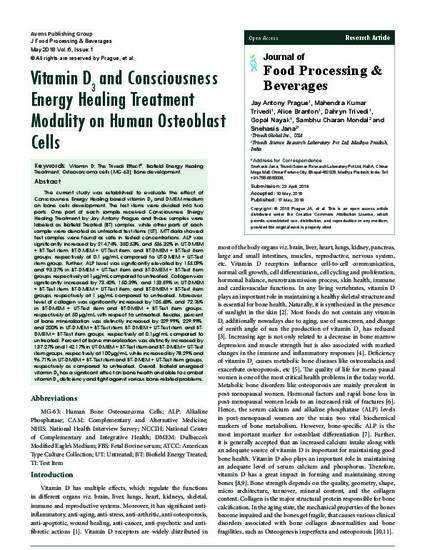 The current study was established to evaluate the effect of Consciousness Energy Healing based vitamin D3 and DMEM medium on bone cells development. The test items were divided into two parts. One part of each sample received Consciousness Energy Healing Treatment by Jay Antony Prague and those samples were labeled as Biofield Treated (BT) samples, while other parts of each sample were denoted as untreated test items (UT). MTT data showed test samples were found as safe in tested concentrations. ALP was significantly increased by 214.74%, 350.53%, and 536.32% in UT-DMEM + BT-Test item, BT-DMEM + UT-Test item, and BT-DMEM + BT-Test item groups, respectively at 0.1 µg/mL compared to UT-DMEM + UT-Test item group. Further, ALP level was significantly elevated by 155.09% and 93.37% in BT-DMEM + UT-Test item and BT-DMEM + BT-Test item groups, respectively at 1 µg/mL compared to untreated. Collagen was significantly increased by 73.40%, 150.39%, and 133.59% in UT-DMEM + BT-Test item, BT-DMEM + UT-Test item, and BT-DMEM + BT-Test item groups, respectively at 1 µg/mL compared to untreated. Moreover, level of collagen was significantly increased by 105.68%, and 72.76% in BT-DMEM + UT-Test item and BT-DMEM + BT-Test item groups, respectively at 50 µg/mL with respect to untreated. Besides, percent of bone mineralization was distinctly increased by 229.99%, 229.99%, and 200% in UT-DMEM + BT-Test item, BT-DMEM + UT-Test item, and BT-DMEM + BT-Test item groups, respectively at 0.1µg/mL compared to untreated. Percent of bone mineralization was distinctly increased by 137.27% and 142.17% in UT-DMEM + BT-Test item and BT-DMEM + UT-Test item groups, respectively at 100 µg/mL, while increased by 78.29% and 96.71% in UT-DMEM + BT-Test item and BT-DMEM + UT-Test item groups, respectively as compared to untreated. Overall, Biofield energized vitamin D3 has a significant effect on bone health and able to combat vitamin D3 deficiency and fight against various bone-related problems. Prague JA, Trivedi MK, Branton A, Trivedi D, Jana S. Vitamin D3 and Consciousness Energy Healing Treatment Modality on Human Osteoblast Cells. J Food Processing & Beverages. 2018;6(1): 7.